Published on April 25, 2018. McDonald's opened its newest restaurant today in its also-new Chicago headquarters building, and this ain't your average Golden Arches. Find out more about that below, as well as what we found out about a burgeoning price war in packaged goods. But first, we begin with the most interesting car ad of the year. It has not been a great year for self-driving tech, with the industry taking an image hit after an Uber self-driving car struck and killed a pedestrian in March. There are less serious concerns about autonomous cars, namely that they could rob people of the thrill of driving. 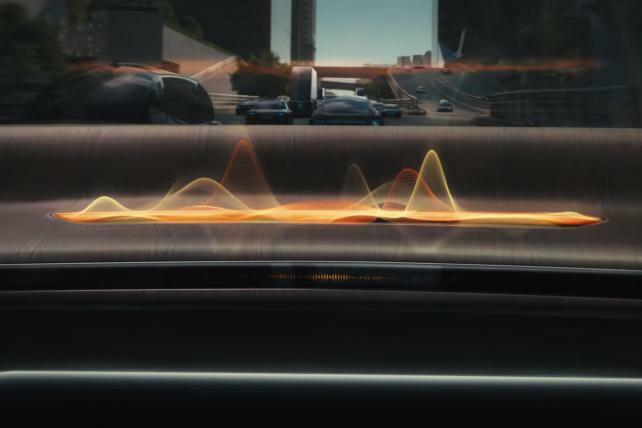 That notion is at the center of a new futuristic Audi ad that shows a man longing for days gone by in which he actually drove. He finally breaks free and jumps into a 2018 R8 Spyder, after wistfully recalling days driving older Audi vehicles, like the 1984 Audi quattro coupe and 2000 Audi TT. The spot is by Venables Bell & Partners and directed by Craig Gillespie, whose film credits include "I, Tonya." Of course Audi, like most major car brands, is simultaneously working on self-driving tech. In a 2016 interview, Loren Angelo, VP of marketing at Audi of America, told Ad Age that the driver won't vanish from its advertising even if Audi eventually reaches full autonomy. "We believe that as a brand, it's part of our positioning," he said. "We know our owners and the people who love our brand love to drive." The newest McDonald's, in the building that will soon house its new headquarters, opened Wednesday with a unique menu including a rotating list of international items. Foods currently on the menu include Canada's Mighty Angus burger, Hong Kong's McSpicy chicken sandwich, Australia's Cheese & Bacon Loaded Fries, Brazil's McFlurry Prestigio and two salads from France. The rest of the menu is a slimmed down version of the U.S. lineup, including the new fresh (not frozen), Quarter Pounder patties. 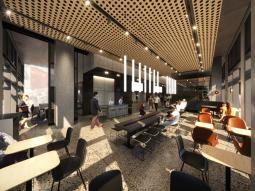 Other global touches include a Latin America-inspired dessert lineup and coffee based on the Australian McCafes, with drinks prepared by baristas on bright yellow Nuova Simonelli machines and made with the same beans used in Australia. It's not what you expect at McD's: There's a wall map highlighting the countries where the food ideas hail from with small McDonald's arches and the decor overall is much sleeker than a typical McDonald's. It shares some design elements of the newer, so-called "Experience of the Future" locations with sleek gray, black, tan and wood decor and a pop of red on the sliding glass entryway. A large table on one side can be closed off with sliding glass doors for meetings. Franchisee Nick Karavites is excited for the city to finish paving the section of Randolph Street out front, which will make it easier for Uber Eats drivers and patrons using mobile order and pay to pull up to dedicated parking spaces out front, a luxury in the West Loop neighborhood. To promote its country as a destination, Switzerland Tourism is pulling out all the stops in a campaign that includes free bike shares, chocolate and cheese. In a marketing push lasting through the end of May, consumers can take free bike rides in certain areas, such as New York, Chicago and Montreal, that are served by Motivate-operated bike-sharing systems. They are also encouraged to send postcards to friends with codes for freebie rides. As an extra incentive, reps from the Swiss tourism agency will dole out free chocolate and cheese at participating North American cities. "Switzerland isn't just about skiing and hiking in the Alps," said Alex Hermann, director, North America at Switzerland Tourism, in a statement, noting the country's 5,600 miles of cycling routes. If there's a price war in packaged goods, Kimberly-Clark Corp. won, kind of, last quarter. Procter & Gamble Co. was a casualty when it reported quarterly results Thursday, disappointing Wall Street with 1 percent organic sales growth on 2 percent volume growth and declining prices. K-C on Monday showed where some of those P&G sales went. The marketer of Huggies, Cottonelle and Scott saw organic sales rise a more-respectable 2 percent on 3 percent higher unit volume as prices fell 1 percent. Since commodity and transportation costs are rising, K-C's operating profit was off 3 percent. On a conference call, K-C executives said they spent less on advertising but quite a bit more on digital coupons last quarter. But no one really wins a price war (except consumers), so Wall Street wasn't really impressed, sending K-C shares down 5 percent and P&G shares down 7 percent during the period fron April 19 to April 24. Both companies are saying price declines should abate and advertising should increase in the quarters to come. SC Johnson has added to its "A Family Company" tagline – a whole six more words in fact. The Racine, Wis.-based family-owned marketer of such brands as Windex, Pledge, Glade and Ziploc is now "A Family Company at Work for a Better World," changing the tagline for the first time in nearly two decades. Chairman-CEO Fisk Johnson, fifth-generation family leader of the company, says in a statement that the company wants people to know it's "committed to doing what's right for our consumers, communities and the environment." That includes a Greenlist program started in 2001 that evaluates every product ingredient for its potential impact on people and the environment. SCJ, moreover, has stepped up its presence in natural household products over the years with acquisitions of such brands as Method and Mrs. Meyers. A video campaign around the new tagline will run such digital platforms as Facebook, Twitter, CNN, Instagram, Spotify, NPR and The Washington Post. Pizza Hut is diving into its role as the official pizza sponsor of the NFL with plans for this month's 2018 NFL Draft including having Steelers wide receiver JuJu Smith-Schuster in an ad promoting delivery on the draft's red carpet, the first time a brand has a spokesperson there, Pizza Hut says. Smith-Schuster's ad suggests people submit "doorbell dances" on Instagram for a chance to win a trip to a regular season game. Other plans including awarding the "Pi Pick," the 14th player picked in the third round (3.14, get it? ), with perks including throwing a pizza party in that player's new hometown and awarding him free pizza for a year. With the draft taking place in Dallas, near Pizza Hut's Plano, Texas, headquarters, on-site plans include a delivery shuttle obstacle course, a lounge and pizza giveaways. Pizza Hut recently tapped CAA as its sports marketing agency. 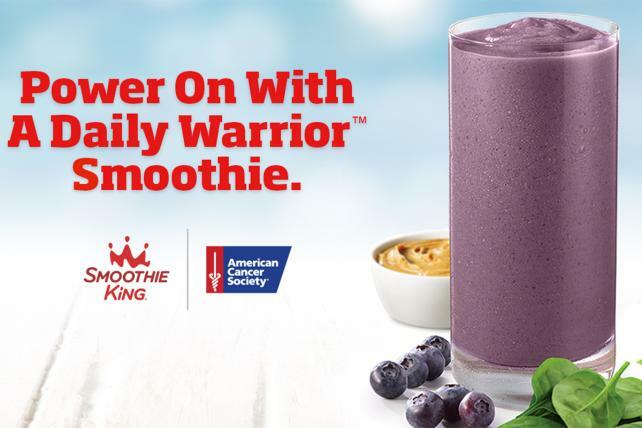 Smoothie King worked with the American Cancer Society to create Daily Warrior, a 20-ounce, 660-calorie smoothie with bananas, blueberries, dates, peanut butter, organic spinach, almonds, blueberry juice blend and stevia that it says is suited for those who need to meet certain caloric and nutritional needs. 100,000: The number of new places to buy an alcoholic beverage in the U.S. that have been added since 2007, according to Nielsen, which notes the expansion of drinking outlets in places like dart clubs, movie theaters, and social ping pong establishments.